A delicious baked ham is an ubiquitous centerpiece on Easter Sunday dinner tables. 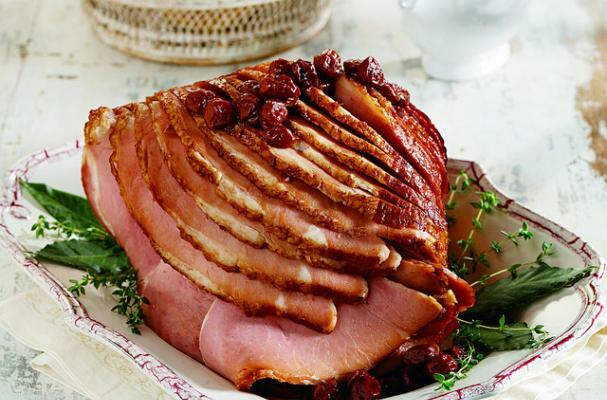 We love this easy ham recipe that features a sweet and savory cherry port glaze. The glaze will keep in the fridge for a few days, so make it now for an easier day of cooking this Sunday! Be sure and check out our Easter recipes Pinterest board for more holiday recipe inspiration! The cherry glaze can be made in advance. Prepare as directed below and let cool to room temperature. Cover and refrigerate for up to 2 days. Reheat the glaze in a 3-quart saucepan over medium heat until heated through, stirring occasionally. Serve with the ham as directed below. Stir the cornstarch and stock in a small bowl until the mixture is smooth. Heat the butter in a 12-inch skillet over medium heat. Add the shallots and cook until tender, stirring occasionally. Stir in the allspice and cook for 30 seconds. Increase the heat to medium-high. Stir the wine, cherries and brown sugar in the skillet and heat to a boil. Reduce the heat to low. Cook until the mixture is slightly thickened, stirring occasionally. Stir the cornstarch mixture in the skillet. Cook and stir until the mixture boils and thickens. Place the oven bag into a large roasting pan at least 2 inches deep. Place the ham into the oven bag. Pour the cherry glaze over the ham. Close the oven bag with the nylon tie. Cut 6 (1/2-inch) slits in the top of the oven bag. Tuck the ends of the bag under to seal. Bake at 250°F. for 1 1/2 hours or until the ham is heated through. Remove the ham from the oven bag to a serving platter. Spoon some of the cherry glaze over the ham. Serve the remaining cherry glaze with the ham.